Mrs. Galloway has been at ICS for 28 years and a part of IBC for more than 40 years. Besides being principal, she has had years of experience in the classroom teaching 3rd, 4th, and 5th grades. She loves ICS because of the Christian atmosphere and all around love for each other. She loves being able to be a part of teaching kids a God's world view. At home, she enjoys working in her yard, walking, a little sewing, and most of all she loves being a Nana. "Thank you so very much for entrusting your children in our care each day. It is so gratifying to know we as teachers are helping to form your children into being Christian leaders and members of society. Blessings!" Mrs. Rodriguez has had a couple roles over the years at ICS. She taught a total of 20 years and has been in the office for three years. She helps out with coordinating weekly chapel and will assist with playing the music- whether it be singing or playing the piano. She loves the Christian environment most at ICS. On her free time her favorite thing to do is be with her family. "Thank you for entrusting us with your child(ren)." Mrs. Savannah has been a employee at ICS for 5+ years and a parent of ICS for 10 years. She is currently the secretary. She loves ICS because it surrounds her children with godly influences and gives them a Christian education. She loves spending time with her family and friends creating memories. "I want to thank you for allowing me to be a part of your child's life." Mrs. Stanley has been a teacher at ICS for 24 years. On top of teaching experience, she has also had 28 years of in children's ministry. She is also a mom of her own for 43 years. Some of her certifications are ACSI continued education and PC continued educations. She LOVES the Abeka curriculum taught at ICS. At ICS, she loves the Christian atmosphere and working with other teachers. Her favorite things to do are teaching Bible to students, read Christian fiction books, cook, and bike ride. "Thank you so much for entrusting your child to our care. I love watching them grow and learn, especially learning about Jesus." Mrs. Adams has been in the childcare field for 8 years total- 4 of which have been at ICS. For the past 2 years she has been the director over the Early Learning Center. She has studied Early Childhood Development at Northwestern State University and earned her CDA. She loves ICS because it has a great atmosphere for herself and children. When she is home, she enjoys sewing, cooking, and spending time with her family. "Thank you for entrusting your children to me...I cannot wait to watch them learn and grow over the year." Mrs. Tayloe has tught for 10 years in both public and private schools. She has a Bachelor of Music degree in Music Education for K-12. She loves the atmostphere at ICS. "It is a relaxed and enjoyable one. The other teachers are a joy to work with." She loves teaching her students about Christ and watching them grow. On her free time, she loves being with her husband and 2 children. She enjoys reading when she can and scrolling through Pinterest. "I just want to say thank you for allowing me the privilege to teach your children. I am looking forward to what this year has in store for each and everyone. I'm praying you have a great year!" Mrs. Hatcher has been a part of ICS for 17 years. For the first 14 years at ICS, she was in the K4/K5 classrooms as a teacher. She's currently in charge of the cafeteria and certified by the state and Safe Serve. She also works in Pre-Care and After Care. She loves working with children. She has been in ministry for 30 years working specifically with kids. When she has time she enjoys reading. "Thank you for allowing me the oppurtunity to work with your children." Mrs. Robin is a teacher's aide in our Early Learning Center. She is a certified babysitter, certified in CPR, and has attended Nicholls State University for childhood development workshops. She loves how ICS is a really good school and everyone is friendly. In her free time, she loves to go out in the boat, fishing, and reading books. "Thank you for giving me the opportunity to help teach kids." Mrs. Bennett was a teacher's aide for a year at ICS and now has a K2 class of her own. She is certified in Health & Safety as well as CPR. ICS has been a big part of her family and is a stepping stone for her children. While not at school, she loves playing with her children and loves doing hair. "I want to thank the parent and families of the children at ICS for letting me teach and influence the lives of your children. I appreciate the time I get to spend with them each day. Every day is a better day knowing that they are learning about Jesus." Mrs. Rita is one of the K2 teachers. She is married with two children who both attend ICS. She has always felt her calling was more than just being a parent but also being a teacher. She loves ICS for many reasons- it offers children and families of many backgrounds the comfort and security of knowing the school offers God given love and learning. On her down time, she enjoys baking, cooking, crafting, and spending time with family. "Thank you so much from the bottom of my heart for trusting me day after day with caring and teaching your babies. Much love and God bless." 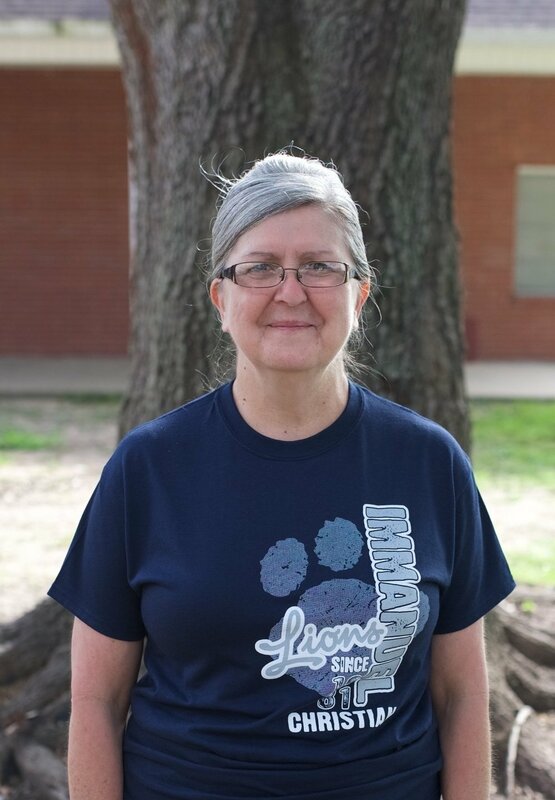 Mrs. Landry has taught at ICS for 18 years. On top of teaching at school, she also has taught Sunday school and children's church at her church. She loves the family atmosphere at ICS. On her free time, she love to reading, listen to music, and work in her yard. "I would like to thank my parents for giving me the privilege and opportunity of teaching your children." Mrs. Schoppe is a mother of 4 beautiful children. Her oldest is 1 and her youngest is 2 so she has been “teaching” for 11 years now. She loves teaching at ICS because the atmosphere produces love for our little ones to know that God is the way. At home, she loves spending time with her kids- whether it be crafting, singing and dancing, and just creating the best memories with them. "Thank you to each and everyone of you for allowing me to touch the hearts of your children and teach them. I love watching them grow daily. God bless!" Mrs. Paddie is a mom of 3 and has been at ICS for 3 years. She is here to love & teach students and win them to Christ. She loves being able to teach at a place where kids can thrive in Christ and learn about Jesus. She loves being surrounded by other Christians. At home, she loves to spend time with her family, crochet, and swim. "I just want to thank all my parents for entrusting me to teach and love on your children where they can learn and grow in Christ." Mrs. Taylor is one of the K3 teachers at ICS. She loves and looks forward to helping the children learn about God and all of His glory. She loves being able to work in a Christian setting. She is also a member of Immanuel Baptist Church. She loves spending time with her family. "I appreciate working with your children and hope I can help them to learn and to have a love for God." Mrs. Yager is our 1st grade teacher. She has two twin boys age 3 who also attend ICS. She has a BS in Forensic Science with minors in Biology and Criminal Justice Administration. She has always had a love for children and God led her to ICS to do what she loves- teaching. She has been in children’s ministry for four years and also coached volleyball for 5 years. She loves the Christian atmosphere and having a staff that prays for their school daily. In her free time, she loves to read and spend time with her family. "Thank you for allowing me the opportunity to shine God’s light into the lives of your children. I’m so blessed and thankful to be a small part of their educational and spiritual growth!" Mrs. Rink has been at at ICS for 4 years teaching 1st grade and now second grade. She is a mother of three- 11, 3, and an infant. She earned her Bachelors of Science in Early Intervention/PreK-3rd at Nicholls State University in 2014. On top of teaching at school, she has also taught Sunday School at Bethel for 12 years. She loves the 'family' at ICS and how everything focuses on the kids spiritual education. She loves that the environment at ICS is so welcoming and loving and its a place you can call home. On her free time, she loves to spend time with her kids, travel, watch NASCAR races with her husband and family, and read. Mrs. Fretz is our third grade teacher at ICS. She has been a mom for 4 years now. She earned her Bachelors Degree in Child and Family Social Services and completed 48p0 hours in student counseling internship. She loves the environment at ICS and that she gets to make a difference in students' lives academically and spiritually. On her free time, she loves to play with her kids, cook, and read. "Thank you parents for allowing me the opportunity to be a part of your child's life and for entrusting me with their education." Mrs. Dinger has been at Immanuel for 5 years teaching music and 4th grade. She has always had a desire to teach since my childhood. She loves working with children. Her 3 children attend ICS and she has loved the positive impact ICS has had on them. "One thing I've learned from teaching is that each day in the classroom is a gift, an opportunity to have a lasting impact on a life and the priceless impact each child will have on you. I thank God for the opportunities and responsibilites He's allowed me to have." 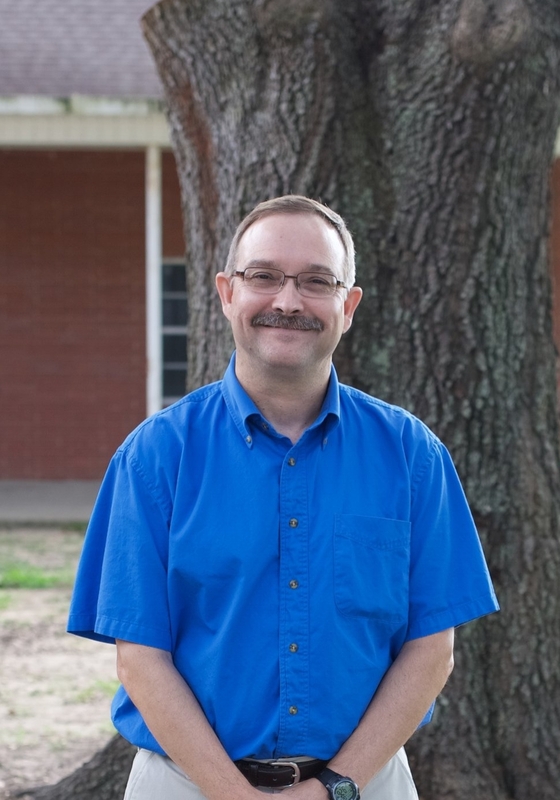 Mr. Michel earned his BGS degree and Elementary Education certification from Nicholls State University in 2000. Mr. Michel taught middle school at ICS from 1995 to 2004. Later, he taught middle school at Highland Baptist in New Iberia from 2004-2009. He then earned his Library Science certification in 2006 from the University of Louisiana and served as the librarian at Highland until 2017. He loves working here at ICS because of the wonderful Christian, family atmosphere. "Parents, thank you so much for allowing me to teach your children, and I look forward to working with you as we guide them in their academic and their Christian walk as well." Mr. Williamson earned his Bachelor's degree at Liberty University in Religion. This is his 3rd year as a full time teacher and 2nd year at ICS. He loves that ICS is a Christian environment and has a Biblical based curriculum. "I look forward to being a teacher and mentor to your students this year and all that God has for us at ICS."